Designed in Germany, these solid brass shower heads are exactly what the doctor ordered for those wanting a soothing shower. Solid brass construction. If you've ever used one, you'll understand why we could sell them for well over $100. 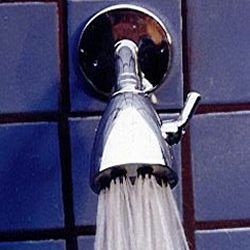 These are the top of the line shower heads. AVAILABLE IN CHROME, BRUSHED NICKEL, OIL RUBBED BRONZE, AND BRASS.